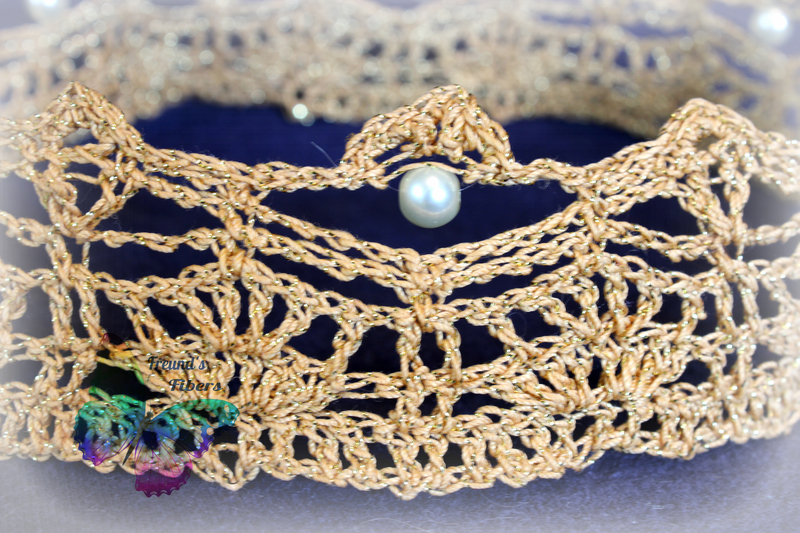 I recently had a client show me a picture of a crown made with thread that they wanted for their daughter’s birthday portraits. After showing them several possibilities we decided on Crown Photo Prop by Puddy Pad Designs. 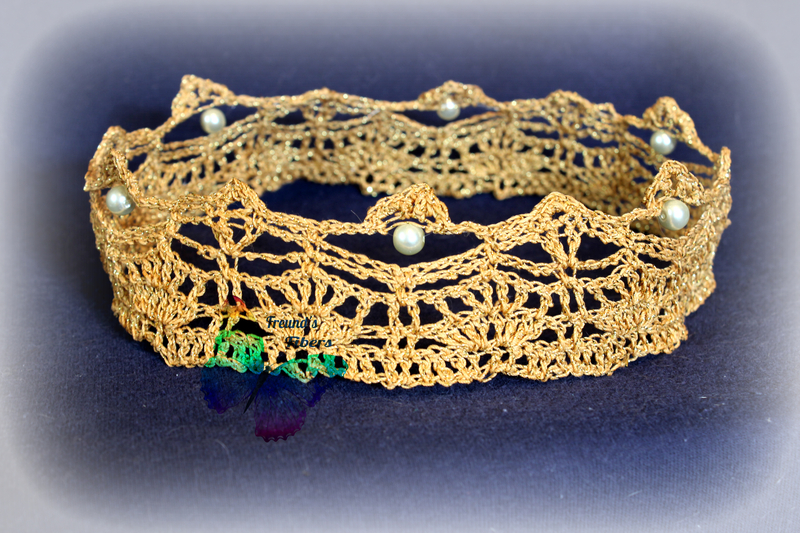 I love that this pattern is simple in design but the finished item looks so elegant. 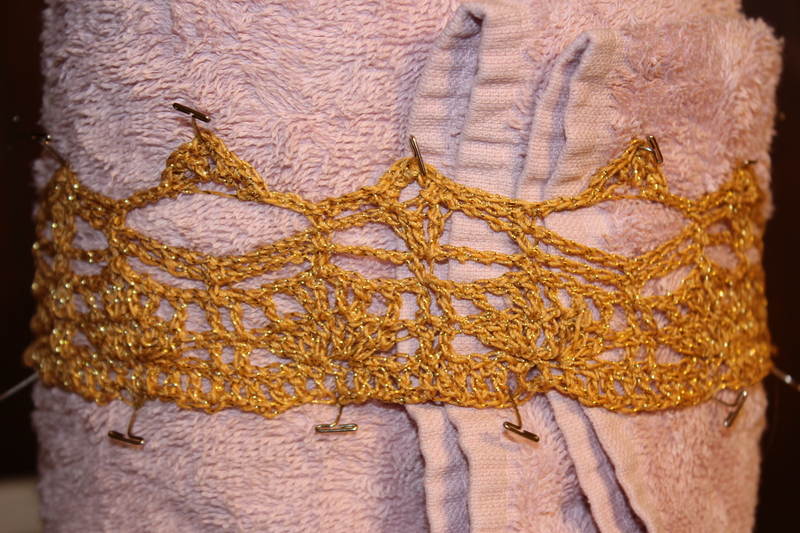 I started with Aunt Lydia’s Size 10 crochet thread in Gold for this project. I came across a small error on Round 3. I contacted the designer and she responded very quickly. The construction of the item is pretty quick. I will say that it doesn’t look too elegant when you finish crocheting it. I sent this picture to my client to let them pick which pearl they wanted for the finished item. They decided on the white pearls. The next step is applying the stiffening agent, shaping the crown and letting it dry. This process took some ingenuity on my part. When I’ve shaped items in the past they have always been able to be done on a flat surface. This needed to stay round though. I ended up wrapping a towel around a 32 oz sports drink bottle. After putting the finished item through the stiffening agent I put it around the towel. I used T-pins to shape and hold the item. It took about two days for it to be completely dry. Here are some pictures of my impromptu crown blocking station. After two days of drying time I removed all of the T-pins. I then removed the bottle from the inside of the towel. Working slowly I gently removed the crown from the towel. Next step was attaching the pearls. For that I used my Sulky Invisible Thread. 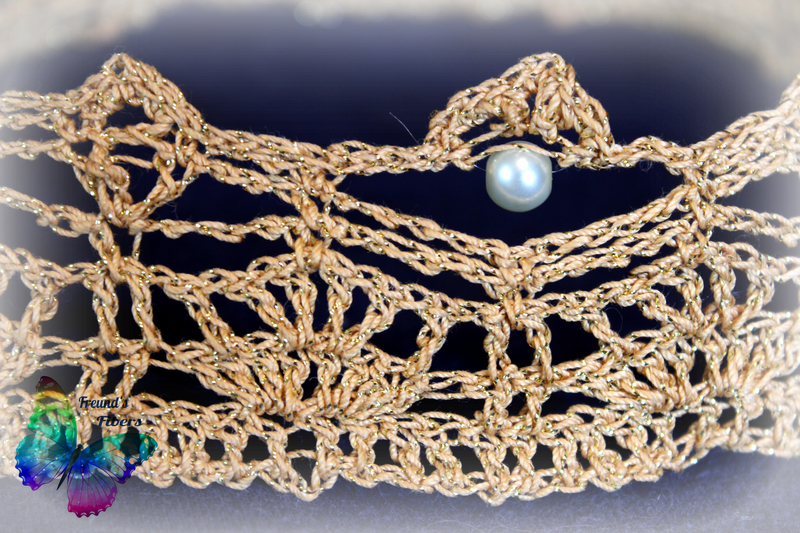 It allowed me to work though all of the stitches around the crown so that I didn’t have to keep cutting and reattaching the thread for each of the pearls. 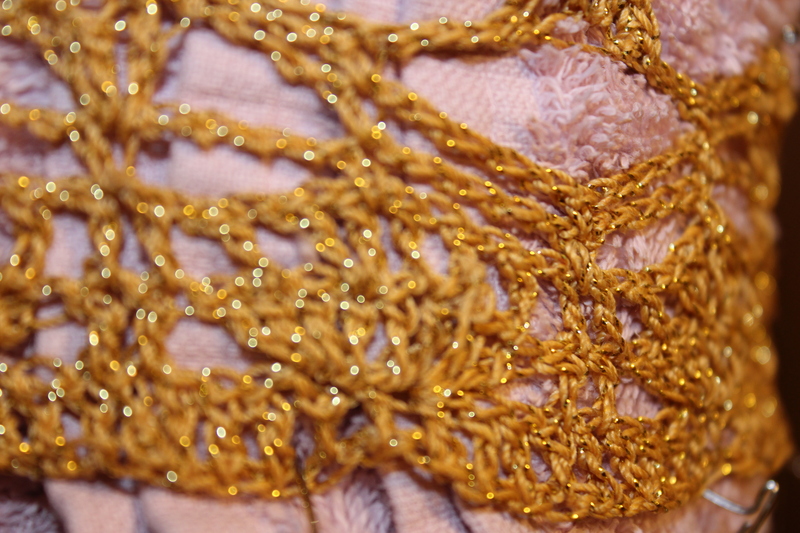 I strongly recommend it for attaching embellishments to any fiber project as it creates a clean look. Last but not least we have the finished item. My client loved it and has promised pictures of it in use. I can’t wait to see it. 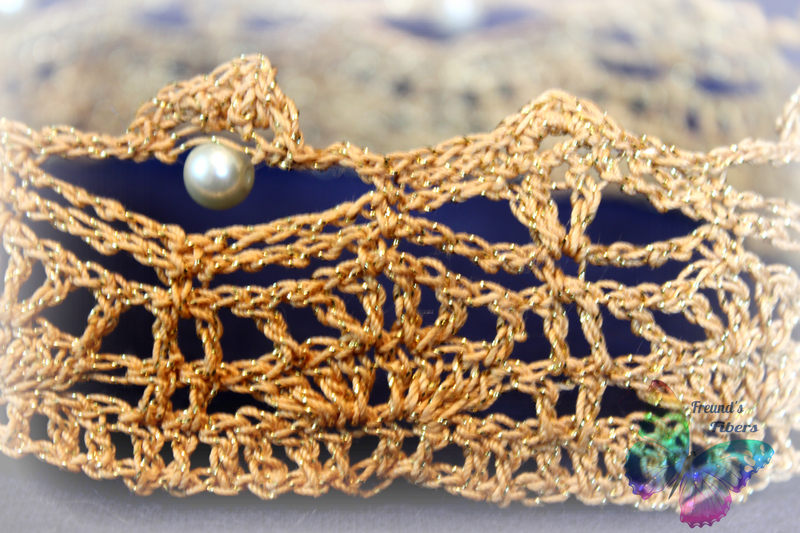 You can see the invisible thread on each side of the pearl but not through the stitches. Thank you to Chelsie from Puddy Pad designs for writing this pattern. 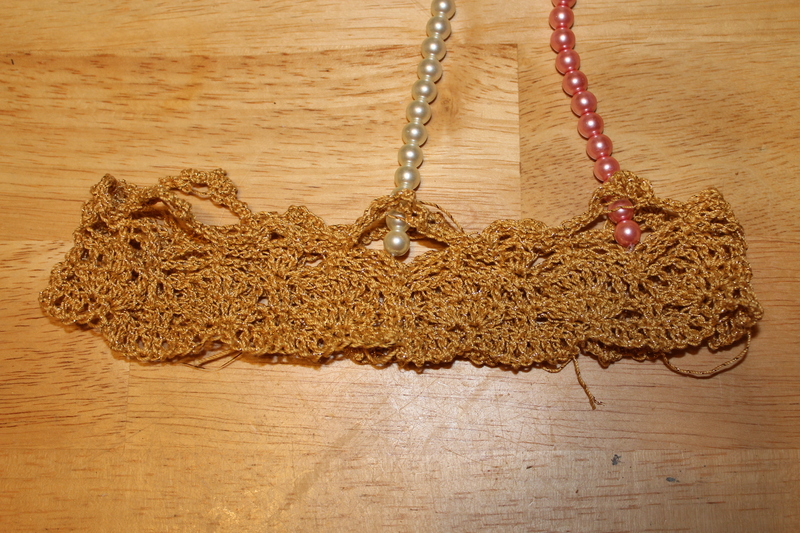 I have many ideas for different color combinations of the thread and pearls. Until next time, see you in the fiber world……..
Lovely! Thanks for showing the process!